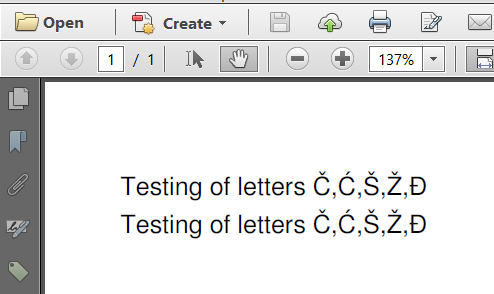 The output I get when the PDF file is generated, looks like this: "Testing of letters ,,Š,Ž,Đ"
For some reason iTextSharp doesn't seem to recognize these letters such as "Č" and "Ć". That is a bad practice. Code files are stored as plain text and can be saved using different encodings. An accidental switch from encoding (for instance: by uploading it to a versioning system that uses a different encoding), can seriously damage the content of your file. This will also make sure that the content doesn't get altered when compiling the code using a compiler that expects a different encoding. Your third mistake is that you assume that Helvetica is a font that knows how to draw these glyphs. That is a false assumption. You should use a font file such as Arial.ttf (or pick any other font that knows how to draw those glyphs). Your fourth mistake is that you do not embed the font. Suppose that you use a font you have on your local machine and that is able to draw the special glyphs, then you will be able to read the text on your local machine. However, somebody who receives your file, but doesn't have the font you used on his local machine may not be able to read the document correctly. Your fifth mistake is that you didn't define an encoding when using the font (this is related to your second mistake, but it's different). To avoid your third mistake, I used the font FreeSans.ttf instead of Helvetica. You can choose any other font as long as it supports the characters you want to use. To avoid your fourth mistake, I have set the embedded parameter to true. As for your fifth mistake, I introduced two different approaches. In the first case, I told iText to use code page 1250. This will embed the font as a simple font into the PDF, meaning that each character in your String will be represented using a single byte. The advantage of this approach is simplicity; the disadvantage is that you shouldn't start mixing code pages. For instance: this won't work for Cyrillic glyphs. This will embed the font as a composite font into the PDF, meaning that each character in your String will be represented using more than one byte. The advantage of this approach is that it is the recommended approach in the newer PDF standards (e.g. PDF/A, PDF/UA), and that you can mix Cyrillic with Latin, Chinese with Japanese, etc... The disadvantage is that you create more bytes, but that effect is limited by the fact that content streams are compressed anyway. As I explained, single bytes are used to store the text of the first line. 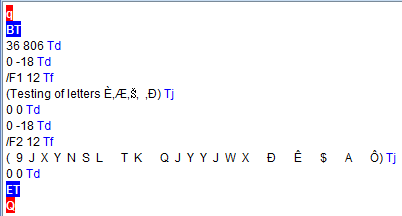 Double bytes are used to store the text of the second line. You may be surprised that these characters look OK on the outside (when looking at the text in Adobe Reader), but don't correspond with what you see on the inside (when looking at the second screen shot), but that's how it works. I'm going to bookmark this answer to use as duplicate for every "Why don't I get characters ... in my PDF"! [SOLVED] How to show the special characters like & in the pdf report generated by iTextSharp?